Adding a phone number to a Google account is not always required, but even if you can get away without adding one, Google will periodically ask you to verify your account when you log in. It's just a security feature that discourages spammers from creating a lot of Gmail accounts, but it's still annoying. "In an effort to protect our users from abuse, we sometimes ask users to verify their identity before they're able to create or sign into accounts. Requiring proof of identification via phone is an effective way to keep spammers from abusing our systems," informs Google. Now when you create a Gmail account, there's a new option that lets you skip the CAPTCHA: "skip this verification (phone verification may be required)". 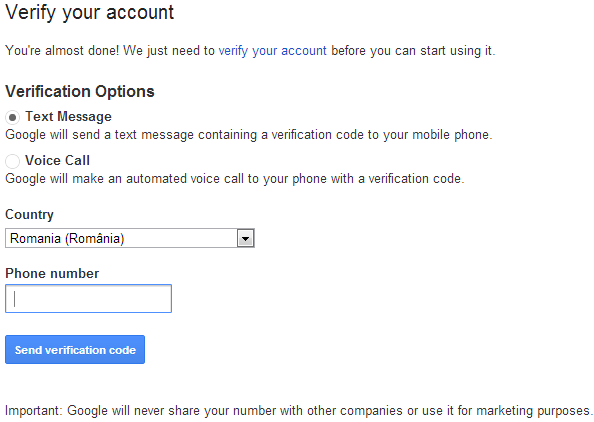 After enabling this option, Google asked me to verify the account by sending a text message or making an automated call. 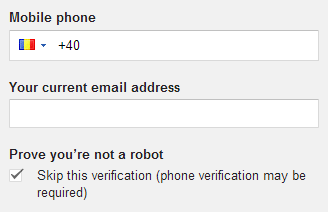 Just because you don't skip the CAPTCHA doesn't mean that Google won't ask for your phone number. I've tested this and Google asked me to verify an account even after solving the CAPTCHA. It's interesting to notice that Google's wording is "phone verification may be required", which means that it's not always required. A few years ago, phone verification was limited to a small number of countries, but now it's widespread. Google still asks you to create a Gmail account when you sign up from Google.com, Google Image Search, Google Translate, Gmail, Google Play and Google+, but you can create a Google account using a non-Gmail email address from other Google services like Google Maps, Google Calendar or Google Drive. Google is desperate desperate DESPERATE to get your mobile phone number, and has been hounding people to give it to them for months. They want the phone number because it's tied directly to a billing system, which means marketing not only through channels like Google Play but anywhere at all. On another note, while it's true you can create a Google account using a non-Gmail email address, Google will assign you a GMail email address (youremail.server.com@gmail.com) and then send all Google related notices to it. My advice is to refuse to create a GMail account with your other email, otherwise your other email address becomes invisible to Google. And if you really, really insist on creating a Google account with another email address, make sure that you never lose access to that address. Or if you do, make sure you go and update the primary email address associated with it. Good thing. I hate captcha. Some are really unreadable and make me loose my temper. I often open Google accounts for my friends, who don't know how to do, and I always feared captchas. My fear is over.Thanks to Google.